Jan Brett is excedingly talented both as a writer and an illustrator. Many illustrators have their own hook but she goes beyond that with her side panel foreshadowing illustrations. A few monthes ago I did a small Jan Brett unit with first grade students. We read a bunch of her books and explored the freebies on her fabulous website and then we moved on and read other stuff. 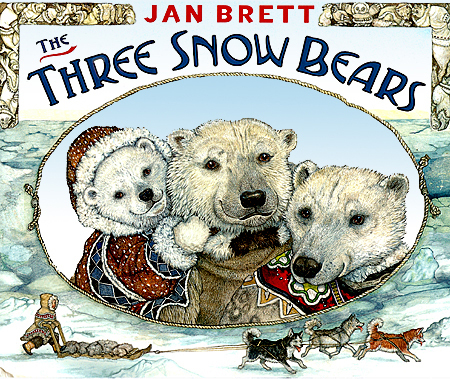 Forever those students will know a Jan Brett illustration when the see it as they showed me this past week when we read The Three Snow Bears, Brett's retelling of Goldilocks and the 3 bears, set in the Artic. We were reading it because we've been reading books about snow, snowmen(people) and this amazing book fit with that and it was a great mini-quiz. Students could tell within several pages that it reminded them of another story they knew...Goldilocks but as many said, she has different colored hair! Well, yes, in this one she is Inuit with dark hair and a huge snowsuit on it. Many loved the dogsled, huskies and igloos...that was new to them. When I explained to them what an igloo was, one student exclaimed "Oh, yeah-I live in one of those!" They love to assimilate, don't they. I haven't used any of Brett's materials with this book before but I notice she has a whole Arctic mural you could use with a class. By the way students passed their author recognition "quiz" as I heard many comments like "Oh, look I can see what's coming next" as they see in the end panel picture. That and they loved staring long and hard at the detailed illustrations. Have you read this one or others of Brett's? Which are your favorites?